Johnny Appleseed, real name John Chapman, was born in Leominster, Massachusetts, September 26th, 1774 to Nathaniel Chapman and Elizabeth Symond Chapman. Nathaniel Chapman, was one of the Minutemen who fought at Concord on April 19, 1775, and later in the Continental Army during the Revolutionary War. Johnny's Mother had three children: Elizabeth born in 1770, John, and Nathaniel Jr who died shortly after birth in 1776. His mother was sick from tuberculosis and died three weeks after her third child. 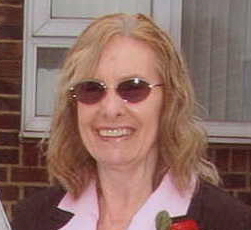 It is reasonable to assume that Elizabeth's parents took care of John and his sister while their father was in the Army. 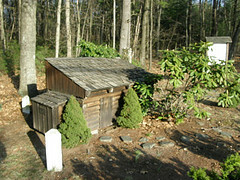 John's father married Lucy Cooley of Longmeadow, MA in 1780 and had a family of ten children. Johnny and Elizabeth lived with them for some time in Longmeadow. Johnny was an almost legendary character and nature lover of the frontier days in the Middle West. Very little is known about his everyday life. John Chapman headed west about 1800. 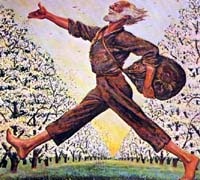 Known as Johnny Appleseed, he carried with him apples for planting, usually along streams (probably obtained seeds from cider mills in Pennsylvania). 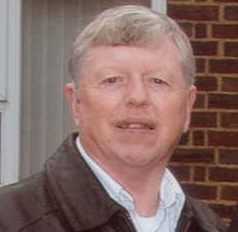 His earliest known apple nursery was planted near Steubenville, Ohio, in a valley near the Ohio River. He located them near settlements where he could walk back and forth to maintain them. He was a practical nurseryman, not a 'scatterer of seeds' as people believed and owned several orchards. He lived the rest of his life in Ohio and Indiana, wandering about barefoot, clad in rags ('wearing a tin kettle on his head', they say), tending the apple orchards he started wherever he found a good spot, and reading aloud from the Bible. He walked alone without gun or knife. He chopped down no trees and killed no animals. He lived very simply. He slept outdoors, ate berries and made his clothes from sacks. He made his drinking water in winter by melting snow with his feet. For Forty-nine years he roamed the American wilderness, devotedly planting apple trees. He created apple orchards in the wildernesses of Pennsylvania, Ohio, Kentucky, Illinois and Indiana, spanning an estimated area of 100,000 square miles. Some of these trees are still bearing fruit after 150 years. The seeds that he planted, and the saplings he gave away (see below paragraph) to the local Indians and the new settlers, helped to build the orchards of the Midwest. Apples were very important to the early settlers. They offered something different in what could become boring daily meals. Easy to grow and store for year-round use, they were dried to eat during the winter, and made into butter and cider. Chapman also planted the seeds of many healing herbs such as catnip, horehound, and pennyroyal. Some could say that he planted spiritual seeds as well. Despite his eccentric appearance, he was regarded as a healer, and even something of a saint, by settlers and Indians alike. 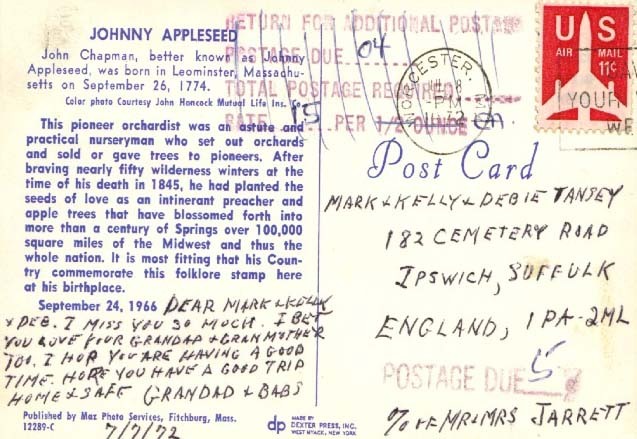 Johnny Appleseed didn't wander the Midwest giving away apple seedlings and seeds, as many believe. In 1806 Johnny charged about 6 cents for a seedling. But if setters couldn't pay, they say he would accept cornmeal, old clothes or a promise to pay in the future. He probably gave trees to needy families. 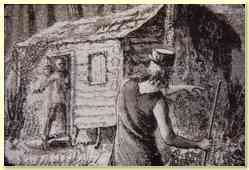 Johnny Appleseed was not a poor man, he was a businessman. He had money, but he used it for charity and to further his work rather than for his personal comfort. John Chapman was a deeply religious man and a self-appointed missionary for the Church of the New Jerusalem, a Christian Church based on the Biblical interpretations of Emanuel Swedenborg. His love for his neighbors made him a peacemaker between the Indians and the settlers. John Chapman died of pneumonia, often called the 'winter plague', on March 18th, 1845, at the age of 70, in the home of his old Richland County, OH friend, William Worth. 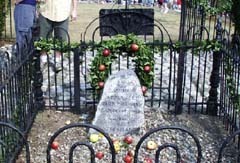 He was buried a few miles north of Ft. Wayne, Indiana, at a 12-acre grave site, which was designated "The Johnny Appleseed Memorial Park" through a gift by Mr. and Mrs. William T. McKay. 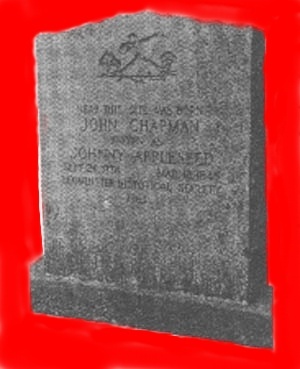 The inscription on the grave stone read, "Johnny Appleseed (John Chapman) He lived for others. 1774-1845"
The City of Leominster, Massachusetts is proud of being the birthplace of John Chapman, known as Johnny Appleseed. They celebrate with a parade in his honor every year. They have also named one of their Schools, Johnny Appleseed Elementary School in North Leominster, after this legendary character. They also have a monument dedicated to him on Johnny Appleseed Lane, the place of his birth, and a statue in front of the Library. LEOMINSTER-- Johnny Appleseed shared the stage with Uncle Sam. In a parade meant to highlight the star of Leominster lore, the theme was less about apples and more about patriotism. From the flag-waving pupils of Johnny Appleseed School to the Leominster-based National Guard unit that carried a large, outstretched flag, the thoughts of many parade participants and watchers were clearly on the recent terrorist attacks. The fifth annual Johnny Appleseed Parade yesterday had the feel of a Fourth of July parade. Many of the thousands of people who lined Route 12 and Monument Square wore red, white and blue ribbons or flags. Vendors quickly sold out of balloons emblazoned with the flag. The National Guard 101st Maintenance Company, carrying a large flag, prompted sitting parade watchers to rise from the curb and their lawn chairs. The unit, like the firefighters and the marching war veterans, remained stoic amid the adulation. We're all behind them, and they should know that, said Jane Colella of Leominster, who watched the parade in Monument Square, occasionally waving a small flag. Her portable chair bore a flag design. Eight marching bands and 14 floats took part in the parade, one of the biggest since the event was started. On Saturday, hundreds of people filled Monument Square for the eighth annual Johnny Appleseed Arts and Cultural Festival. At the parade, the Leominster Colonial Band stuck to the theme, with a crisp rendition of It's a Grand Old Flag. One float displayed a large picture of the New York skyline before the collapse of the World Trade Center towers. Johnny Appleseed himself, or at least Carl Querino of Marlboro, who portrayed him, was in a patriotic mood at the parade. His trademark walking stick was adorned with an American flag. By George Snell, Telegram & Gazette Staff. LEOMINSTER...Ever since his birth certificate was found collecting dust in City Hall archives in the 1930s, Johnny Appleseed has been embraced by the city of his birth. An elementary school in North Leominster bears his name. The road that passes by his birthplace is named after him. A granite marker rests on the site of the farmhouse were he was born. His bronze bust graces the entrance walk to the public library. A billboard on Route 2 declares the city as his birthplace. Three years ago, state Rep. Mary Jane Simmons, D-Leominster, even convinced the state Legislature and Gov. William Weld to declare Johnny Appleseed the official folk hero of Massachusetts. So it is no surprise that Leominster makes the apple-picking season the occasion for an annual Johnny Appleseed celebration. This weekend the city will have a tripleheader: The sixth annual Johnny Appleseed Festival; The fifth annual Johnny Appleseed 5K Road Race; And the third Johnny Appleseed Parade. The festivities begin at 9 a.m. Saturday with the road race. Richard M. Marchand, festival organizer, said he expects more than 300 entrants, about 200 from school children. The road race starts and ends at City Hall. Registration the day of the race is $9 ($7 for advance registration) for adults and free for children under age 18. The first 100 people to sign up get a free T-shirt. Saturday the festival kicks off at 10 a.m. with an apple pie bake-off. Contestants should bring their pies to the Unitarian Church. The first place winner gets $100, second place $50 and third place $25. Afterwards, Monument Square becomes a festival ground. Marchand said there will be 11 food venders and about 100 crafters selling their wares: teddy bears, blankets, picture frames, toys and fabrics. The festival will feature a full petting zoo, three kiddie rides (including a trackless train), interactive sports exhibits, and a photography exhibit and contest. The Johnny Appleseed Parade will wind its way through the downtown at 2 p.m. Sunday. The parade features more than 80 entrants, including fire trucks, dancers, bands and more than 20 floats. �So far, it is the biggest parade of the three we've had,� Anna M. Hamblin, the parade director, said. The festival, road race and parade are paid for through private donations. LEOMINSTER-- The imposing figure of Johnny Appleseed, all 9 feet of him, is striding forward, seemingly ready to go back downstairs and outside City Hall. The wood statue was placed in the main entryway Friday by a crew that maneuvered the 800-pound piece from the parking lot, up a set of stairs, to its new home in the main corridor. The piece was sculpted two years ago by Oklahoma artist Clayton Coss, who used three chain saws to carve the folk hero. 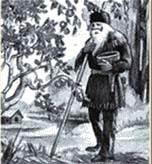 John Chapman, a nurseryman who later became known as Johnny Appleseed, was born in Leominster but moved away as a young boy. The sculpture was commissioned by a group of private donors, led by David P. Mattos. The statue, which cost around $15,000, was carved from an ash tree outside Mr. Mattos' home at 50 West St.
Mr. Coss carved the statue from an ash tree that had been severely damaged during a winter ice storm, Mr. Mattos said. When workers came to remove the damaged tree, Mr. Mattos told them to leave about 20 feet of it. He then invited Mr. Coss, whose work he had seen in Oklahoma, to carve Leominster's hometown hero from the tree. After Mr. Mattos sold the home, he had to find a new place for the massive sculpture, he said. On Nov. 1, Peter D. Dandini, of Dandini Landscaping Co., cut the statue away from the stump, rolled it onto a pallet and stored it at his business. When the decision was made to bring it to city government, Mr. Dandini took it to the Department of Public Works, where it was stored for three weeks in a heated garage until being moved to City Hall. DPW workers paid $240 to Hartman Relocation Services Moving & Storage Co. for the move. The statue was protectively wrapped, then maneuvered through the 7-foot door at City Hall. The movers used a ramp to get the statue up the stairs, said an aide to Mayor Dean J. Mazzarella, Anna M. Hamblin. The decision to send the statue to City Hall was made because of fears it could be vandalized if left outside, Mr. Dandini said. Even aside from worries about vandalism, there were concerns that the weather, particularly winters, would damage the statue, Mr. Mazzarella said. �I think he'll be safe here,� the mayor said yesterday. The statue could end up at Sholan Farm, the orchard the city has agreed to buy. The orchard is intended to become a living memorial to Johnny Appleseed. �I can't exactly keep it in my front room,� Mr. Mattos joked. Although Mr. Mattos said the statue was donated to the city, Mr. Dandini said the matter still has not been decided. The owners still must get together to discuss the ownership issue, he said. History and Legends of Apples...Eveything you always wanted to know! Dedicated to Johnny Appleseed at his birth marker!